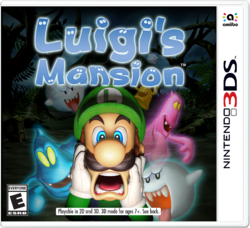 Luigi's Mansion is a remake of the Nintendo GameCube game of the same name released in 2018 for the Nintendo 3DS. It was first announced in a Nintendo Direct presentation broadcast on March 8, 2018 and initially released in North America on October 12, 2018, a week later in Europe and Oceania, and the following month on November 8 in Japan, South Korea, and Hong Kong. 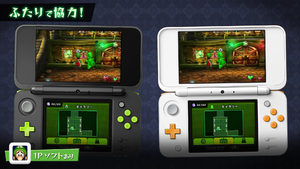 Among the new features, the remake includes a map that appears in the bottom screen of the Nintendo 3DS, as well as a redesigned Gallery with a Boss Rush mode that allows players to battle against already defeated Portrait Ghosts. The game can be played in single player or multiplayer alongside a slime-themed Luigi, dubbed Gooigi, brought from the future by E. Gadd. The game requires 1778 blocks for a digital download from the Nintendo eShop. The touch screen is used to view the map, ghosts and collectibles, as well as to reply to E. Gadd. The game can be played in multiplayer, with the second player controlling Gooigi. The Luigi amiibo gives the player a Gold Bone and revives Luigi with a Polterpup, and identifies the locations of Speedy Spirits in dark rooms. The Mario amiibo turns Poison Mushrooms into Super Mushrooms, restoring 25 HP upon collecting them. The Toad amiibo refills Luigi's HP when talking to Toad. The Boo amiibo tracks the location of Boos on the touch screen if they escape. Pressing X will not let the player choose a file to erase (or Y to copy). The player needs to choose a file and select Erase the File (or Copy Data). Due to the lack of Game Boy Horror functionalities at the start of the game, the "Your Mansion" map is displayed on the touch screen. The player can use the buttons of the Game Boy Horror on the touch screen while in Search mode. The player controls the direction Luigi is facing and the Game Boy Horror's first person screen by using the 3DS' gyroscope rather than . There are now two control methods to catch ghosts: the flashlight, which is similar to the GameCube version, and the Strobulb, which is similar to Luigi's Mansion: Dark Moon. The Circle Pad Pro accessory can be used on a regular Nintendo 3DS to play the game as well. Luigi can go back to The Lab any time by opening the mansion's front door within the Foyer. However, this is impossible during the blackout; instead, it will show a message if attempting to leave: "...The door is locked by a mysterious force." While in the Lab, there are more options to choose from, now consisting of: "The Mansion," "The Hidden Mansion," "The Gallery," "Save," "amiibo," and "Play Co-op." The brand new Gallery area can be used to battle already beaten portrait ghosts for the Boss Rush mode either in single player or in multiplayer alongside Gooigi, who has 50 HP. Players can now unlock achievements by completing certain tasks in the game. Loose coins from physical damage and collecting large amounts of money and gems last a few seconds longer before disappearing. When the player collects an item (key, gem, etc.) while there is money laying around, this will pause the timer to prevent money disappearing. Gold Bones return to provide Luigi with extra lives upon using the Luigi amiibo. If Luigi loses a life while holding a Gold Bone, a Polterpup will appear and revive him, like in Luigi's Mansion: Dark Moon. Players have an option to skip the King Boo intro cutscene before the final battle begins by pressing ; however, this is only possible if the player quits the game after seeing the cutscene, was defeated while battling the final boss, or when entering the cutscene the first time in Hidden Mansion mode. The ability to drain ghost's HP much faster is removed. All ghosts, including Portrait Ghosts and Boos, have more HP (their base HP have been multiplied by 1.5, which allows Luigi to obtain more pearls from Portrait Ghosts). Powerful ghosts appear more often in dark rooms (except during the blackout). Hearts are replaced by Poison Mushrooms, though the player can still get hearts by catching two or more ghosts. For unknown reasons, however, there is a chance that a heart will appear during the King Boo battle when Bowser destroys a pillar. Speedy Spirit locations have been changed. Blue Mouse, Purple Mouse and Flying Fish (pink and green) will appear in some dark rooms, making catching ghosts more difficult. Sparks will appear on the left side of the F1 hallway. Mario's Hat is found in the Kitchen. Mario's Letter is found in The Twins' Room. Mario's Shoe is found in the Billiards Room. Mario's Glove is found in the Courtyard. For non-boss ghosts, Luigi must drain 140 HP in one go. It is possible to get more pearls by doing so. For boss ghosts, Luigi must finish the battle with at least 95 HP. Chauncey and Boolossus have the same battle effects from the PAL GameCube release. Bogmire appears in one location for a few seconds before reappearing in another. King Boo's spike bombs explode seconds upon being thrown the first time, while they may or may not explode the second time. Defeating Slim Bankshot is now required, whereas Henry and Orville are optional. S rank is a new rank, making it the highest rank in the remake instead of the A rank as in the original game, though much like the A rank, can only be achieved in the Hidden Mansion due to more pearls and such being thrown out by portrait ghosts. The intro with a very low-pitched voice saying "Nintendo" is removed. The box art updates Luigi's appearance. His torso is more visible, his individual mustache hairs are defined and his clothes have simple detailing, his cap receives more shadows and hides more of the "L", Luigi overall resembles his current appearance since Mario Party 4, and the Boos have the additional two teeth from their current appearance like in the sequel. The text is also shifted, causing the Gold Ghost and Boo in the background to be more visible. The remake's overall walking style and design resembles that of the sequel rather than the original game. The lightning behind the Mansion is purple-colored and brighter. There are more trees in front of the Mansion's front yard and grounds outside of the gate. The broken-down horse carriage wagon outside the Mansion's gates is rotated and slightly different. The Mansion's gates have an arch design rather than being flat. Tombstones are positioned slightly different in front of the Mansion. The crows in the intro cutscene have visible feathers. The camera angle is more zoomed out. Less dust is expelled while Luigi is walking. There is a machine in the background of The Lab with animation of the pressure arrows moving. If Luigi attempts to open up a locked door, there is an animation of Luigi showing confusion. The glass around the Parlor doors has a different design. The Parlor's doorknobs have a different design. The Foyer, Training Room, Anteroom, Storage Room, Mirror Room, Graveyard's battle arena, Bathroom (2F), Balcony (3F), Breaker Room, and Clockwork Room have a different floor design. Ghosts are not as translucent. Gold Ghosts, Temper Terrors, Speedy Spirits, Purple Punchers, Flashes, Blue Twirlers, Blue Blazes and Bowling Ghosts have new animations when they appear instead of having their arms held up in the original release. The Training Room is different, featuring flatter pipes with several smaller pipes leading to a red value on the walls, a different wall design, two ceiling lights, and two Pixelators. Gold Ghosts pop out of the Training Room's green pipes as orbs instead of full fledged ghosts, similar to the Gold Ghost carrying the Parlor door key in the Foyer at the beginning of the game. Ghost paintings have been redesigned. E. Gadd's "Famous Ghost Collection" (not including Boolossus and King Boo) was composed of 25 paintings, four more than in the original version. The Gallery now lets Luigi view all the portraits of the portrait ghosts from the bottom to top depending on either the size of pearls dropped or health lost in battle. The search tool on the Game Boy Horror needs to be obtained by Luigi in the Gallery. Room names are displayed on the top screen upon entering a room, despite already being said on the lower touch screen, along with currency and ghosts captured. Toad's voice is redubbed, as his original voice actress, Jen Taylor, was replaced by Samantha Kelly. There are cutscenes for when vines appear or disappear on doors, along with a cutscene for Spooky's doghouse in the Boneyard. Some heart quotes have been added or altered. Chauncey's eyes are completely closed while sleeping in the Nursery and his winking animation is much more detailed before the boss fight begins. The area key chest rewarded for beating Chauncey has been moved farther away from the wall, preventing sequence breaks. The generator in the Breaker Room now has an animation of the pressure arrows moving when it is active. The Area doors lack vines and their emblems will illuminate and go faint repeatedly once their respective keys has been achieved and are trying to be opened. There is a different painting in the first-floor Washroom. The Boo icon that shows how many Boos are captured is from Super Mario Maker instead of an original sprite. The Luigi icon on the map is from Super Mario Maker replacing the Luigi sprite from the Super Mario All-Stars version of Super Mario Bros. from the original. Elemental Ghosts are more transparent. The Conservatory has a slightly different painting, with the early unused blue ghosts holding their respective instruments slightly higher. The deer head's eyes change color when vacuumed in the Safari Room. The lights in the Balcony (3F) are purple-colored during the Boolossus fight. Professor E. Gadd's hint given in the Telephone Room about Uncle Grimmly's location has been changed to be more specific, adding that the ghost prefers rooms "with clothes and a mirror." The pillars on the roof now have plants, though they cannot be watered. The Secret Altar has lion heads with a different design. The Mario painting in the Secret Altar is an oil painting style, much like his painting in Luigi's Mansion: Dark Moon, rather than the blurred style in the original game. Mario's dialog box is colored red instead of purple, with his head displayed beside the text. The dialog boxes (as well as the text and the head of the character who talks) have been enlarged, with the boxes taking up the full width of the screen instead of using a smaller rectangle at the top left corner. All the ghosts has now their own dialog box with their head instead of a headless purple one. The Roof's fiery backdrop includes a swirling tornado of fire speeding across the area. In addition, its pillars are more intricately designed and the plants on top of them are purple-colored. The Bowser suit's model has been revamped to maintain his current proportions. The Bowser suit now has a new animation for when its head is detached: instead of its body standing in a dazed position, it raises its arms upon losing its head before slumping down to the ground. King Boo now visibly wriggles his way out of the Bowser suit as opposed to simply exiting it. Speedy Spirits that have not been captured do not reappear during the blackout. The Rank D mansion is slightly different compared to the GameCube release and in the opening of Luigi's Mansion: Dark Moon, showing only one roof instead of two. The Rank B, G and H mansions now only show daytime portraits rather than Rank B showing sunset, Rank G showing nighttime, and Rank H having an old frame. There is one more Green Stone than in the original game, which can be found in the Sealed Room inside the chest on the floor on the right side of the room. In the Ghost Portrificationizer room, there are red and green lights instead of blue. If the player gets a Game Over in Portrait Battle, the screen will say "Too Bad..." instead of "Good Night". Totaka's Song can now only be heard on the screen where the player chooses a control method for the first time. The first half of Totaka's Song is heard slightly in the Gallery. A unused voice clip from within the original game's files, "Nice Doggy! ", can be heard in the remake when Luigi is in the Boneyard talking to Spooky. There is an audible sound that plays whenever the Bowser suit adjusts its head. Achievements are divided into five different levels (Beginner, Easy, Normal, Hard, and Master), and can be viewed through the Options on the pause menu or by interacting with the statue in the Gallery, located next to the right-side stairs. When Luigi first visits the Gallery, only the statue stand is present. As the player completes each level, statues of different ghosts are added to the stand. Completing all achievements in the game turns the stand gold. Clearing the Beginner level adds a statue of a Gold Ghost to the stand. Novice Hunter: Vacuumed a total of 50 ghosts in the mansion. Rich! : Collected a total of 1,000,000G. Area 1 Cleared! : Cleared Area 1. Gold Ghost Collector: Vacuumed 10 Gold Ghosts. Oh, Shiny! : Acquired a jewel. Poltergusting 101: Vacuumed five or more ghosts during the training. No Fool: Burned a fake door. Portrait Buff: Obtained five pictures of portrait ghosts. Clearing the Easy level adds a statue of a Garbage Can Ghost to the stand. Seasoned Hunter: Vacuumed a total of 100 ghosts in the mansion. Really Rich! : Collected a total of 30,000,000G. Elemental Mastery: Collected all element medals. Two for One: Vacuumed two or more ghosts at once. Shiny, Squeaky: Defeated a Gold Mouse. Can't Outrun the Poltergust: Defeated a Speedy Spirit. Poltergusting PhD: Vacuumed all ghosts during the training. Hidden Treasures: Found the Hidden Room or the Sealed Room. Boo-nalysis: Vacuumed 20 or more Boos. Clearing the Normal level adds a statue of a Purple Puncher to the stand. Ace Hunter: Vacuumed a total of 250 ghosts in the mansion. Super Rich! : Collected a total of 100,000,000G. Portrait Master: Obtained pictures of all the portrait ghosts. Mansion Cleared! : Cleared the mansion. It's a Secret: Acquired the secret key in the Rec Room. Green Thumb: Finishing growing the plant in the Boneyard. Dream Home: Acquired a mansion of B rank or above. Bookworm: Read all the books in the mansion. Timed Challenge Champ: Vacuumed all the Portrait Battle ghosts in five minutes or less. Clearing the Hard level adds a statue of a Blue Twirler to the stand. Legendary Hunter: Vacuumed a total of 500 ghosts in the mansion. Mega Rich! : Collected a total of 300,000,000G. Golden Gallery: Framed all of the portrait ghosts in gold. Dream Mansion: Acquired a mansion of A rank or above. Hidden Mansion Cleared! : Cleared the hidden mansion. Skilled Player: Cleared the mansion without ever having 50 Health or less. Golden Mischief: Defeated 20 Gold Mice. Not Speedy Enough: Defeated 30 Speedy Spirits. Boo Master: Vacuumed all the Boos. Clearing the Master level adds a statue of a Grabbing Ghost to the stand. Master Hunter: Vacuumed a total of 1,000 ghosts. Uber Rich! : Collected a total of 500,000,000G. Platinum Gallery: Framed all of the portrait ghosts in platinum. True Dream Mansion: Acquired a mansion of S rank. Jewel Collector: Acquired 100 jewels in the mansion. Expert Player: Cleared the mansion without ever having 80 Health or less. Speedrunner: Cleared the mansion or hidden mansion in three hours or less. Super Boss Guster: Vacuumed all the Portrait Battle ghosts in three minutes or less. Poster Perfectionist: Found all the posters with the picture of Boo. Luigi's Mansion: Dark Moon: When Gooigi is introduced, the Professor E. Gadd from the future that sent him is the one from during the events of this game. The ring tone that plays during future E. Gadd's call is that of the Dual Scream, and Gloomy Manor can be seen on the monitor behind him. The redesigned Gallery features what looks like a Pixelator screen on the south wall, which Luigi ponders the purpose of if scanned with the Game Boy Horror. Like the original game, the remake received mostly positive reviews. Praise was aimed towards the new features, graphics, and the use of the touch screen as well the use of 3D, which was an idea for the original version, but scrapped due to the high cost. However, the multiplayer received mixed impressions, and the lack of improvement to the original game's graphics in certain locations, such as the Mirror Room, was criticized. While the controls were easy to handle, the motion controls received some criticism, being described by IGN as "a purge." Nintendo 3DS Jared Petty, IGN 7/10 "Luigi's Mansion is a fun exploratory adventure game that remains pretty enjoyable despite some annoying control issues and design anachronisms. A full remake that embraced a more modern and polished battle system along with better puzzle design would have made it even better." Nintendo 3DS James O'Connor, GameSpot 7/10 "Seventeen years after its first release, with one sequel out and another on its way, there's still nothing quite like Luigi's Mansion. Nintendo's strange foray into the paranormal has aged well--I was surprised at how much of it had stuck in my memory, and how good it felt being back in its haunted halls. It's a basic port with a few issues, but Luigi's Mansion still remains a charming and enjoyable game.'" Nintendo 3DS Steve Bowling, Nintendo Life 8/10 "Luigi’s Mansion proves that there’s still life in the 3DS, even as the Switch seems positioned to become its replacement. This version is so much more than a look at a title from that past. We’re getting to play a lost piece of Nintendo’s history; a game that was originally designed for 3D, but was never fully realised due to the limitations of the technology at the time. After nearly two decades, we're playing Luigi's Mansion as it was originally intended, and it is as fun now as it was when the GameCube launched. If you’ve never played it before, you should definitely pick up this version. If you already have, the added functionality in the 3DS port provides more than enough reason to pick up the Poltergust one more time, although if you're one of those people who found the 2001 original disappointingly shallow (yes, such people actually exist), then this update is unlikely to change your mind, even with the welcome introduction of 3D support." Nintendo 3DS Dan Roemer, Destructoid 7.5/10 "Some technical and control issues aside, I still think the 3DS version of Luigi's Mansion is a solid option for newcomers or for people looking to revisit this GameCube classic. Catching various ghosts and completing Professor E. Gadd's gallery is a perfect time burner on the go and Grezzo have done a solid job bringing Luigi's Mansion to the 3DS. I just don't know if I'd prioritize playing the 3DS version over the GameCube version in the future.'" At launch, the game sold 27,000 units in Japan, which was about 45 percent of its launch stock.. By the end of 2018, the game had sold 90.410 units in Japan, making it the 3rd best-selling 3DS release of 2018 behind WarioWare Gold and Detective Pikachu. The remake was developed by GREZZO Co.,Ltd., who previously developed remakes in the Legend of Zelda series, and directed by Katsumi Kuga. The original game's producer and director, Shigeru Miyamoto and Hideki Konno, respectively, were credited under "Special Thanks," while the original composer Kazumi Totaka served as sound supervisor. ↑ Nintendo of Europe. (August 21, 2018). Back on his feet, Luigi hopes his next trip to a haunted house turns out better when #LuigisMansion comes to #3DS on 19/10 – just in time for Halloween!. Twitter. Retrieved August 21, 2018. This page was last edited on April 12, 2019, at 14:16.